93 November 1934 The Woman's Christian Temperance Union met Nov. 20, 1934 with Mrs. J. H. T. Main and Mrs. Rose Goodwin. Devotions were by Mrs. E. M. Kearney. The guest artist, Miss Annette Popma, sang "My Task." About 25 were present. The group sang "This is My Father's World." Minutes of the Sept. meeting were read and approved. Minutes of Oct. meeting were read and corrected. Miss Butler talked about an article in the Christian Century which has been printed. Told about the Young Crusader being put in the Des Moines Sunday Schools. Miss Bailey reminded us that this is the day to elect the program committee. She moved the election of Miss Butler, Mrs. Hamilton and Miss Park. Carried. Dr. John Parish gave us a talk "The Drinking Driver." Miss Butler made an informal report from the nominating committee. Mrs. Robert Lincoln said this was the time to decide whether or not we will have blotters. We voted to have them. All unions may draw on county union for money for blotters. 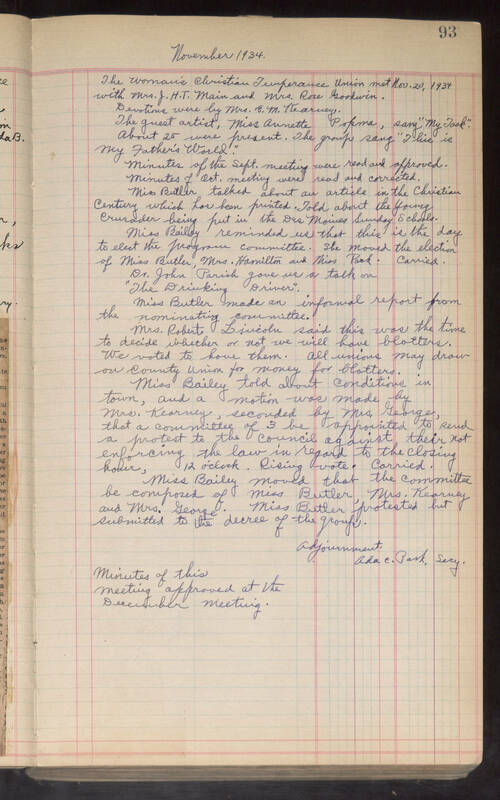 Miss Bailey told about conditions in town, and a motion was made by Mrs. Kearney, seconded by Mrs. George, that a committee of 3 be appointed to send a protest to the council against their not enforcing the law in regard to the closing hour, 12 'clock. Rising vote. Carried. Miss Bailey moved that the committee be composed of Miss Butler, Mrs. Kearney and Mrs. George. Miss Butler protested but submitted to the decree of the group. Adjournment. Ada C. Park. Secy. Minutes of this meeting approved at the December meeting.